Williams Company’s Washington Expansion Project (WEP) starts right there in Sumas, WA, planning a 36-inch pipeline 140 miles down the I-5 corridor right past Seattle, Tacoma, and Olympia, crosses the Columbia River, and looks like it’s headed for Portland or parts much much farther away. It is to include five new or upgraded compressor stations, such as one at Sumner, WA, 12 miles from Tacoma. 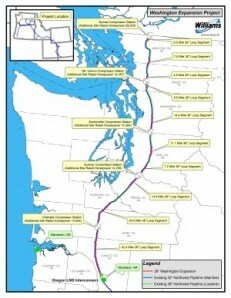 Now that Oregon LNG admits it wants to export gas, how will it get massive volumes of gas to Warrenton, OR? Williams Pipeline Company disclosed that it will build 136 miles of new, high-pressure pipeline across the State of Washington in order to feed North American gas to Asia via Oregon LNGâ€™s proposed export terminal. Segments of the new LNG pipeline would run from Washingtonâ€™s northern border south to Woodland, Washington, threatening hundreds of landowners and communities along the way. See full map here. Oregon LNG failed to include the huge new proposal in its application to the Federal Energy Regulatory Commission (FERC). In a July 16, 2012 letter, FERC told Oregon LNG that FERC will evaluate the Williams Pipeline in Washington in the same Environmental Impact Statement as the LNG export terminal. This makes sense. FERC is not allowing Oregon LNG to piecemeal the project. Instead FERC’s review will include the impacts of a huge new pipeline on family farms, forests, and streams in Washington. Oh, but FERC is helping Sabal pretend they are “not familiar” with the three already-authorized LNG export operations right at the end of the Williams Transco -> Sabal Trail -> FPL’s FSC pipeline in Florida. See the Oregonian’s coverage of this important issue. Oregon residents successfully fought off the LNG pipeline proposal through the Willamette Valley. Now, Oregon LNG has set its sights on Washington. WEP is FERC docket CP13-507. And it’s the same Williams-Spectra LNG export boondoggle in the Pacific Northwest we’re fighting here in the Atlantic and Gulf southeast: 36-inch pipelines gouging through the countryside to get to the sea for export. If Williams’ WEP is supposed to run down an interstate corridor, why is that not required to be an option for Sabal Trail? As EPA pointed out for Williams’ Constitution Pipeline in Penn. and New York State, their pipeline EIA is insufficient without an interstate highway option. So, where’s the option to run down I-75? At least that could go over our rivers on the highway bridges instead of gouging under them. Was that the hastily-rejected Hillabee Route? Was it abandoned because of population density? How can that be, if WEP runs down I-5 right by much bigger population centers? And if Sabal Trail is too dangerous for cities, why is it not too dangerous for our fields, forests, wetlands, and rivers?